Dinner in the highly recommended Gian mas restaurant last night was the usual disappointing Greek restaurant. I shared a grilled fish platter with S. By the time it arrived, an hour later, it was cold and we’d filled up on bread. So, I made three cats very happy. I figured they would enjoy the food more than we did. The messy leftovers near the table were not my problem. Make cat-quality food, slowly, serve it cold, what should a restaurant expect unhappy customers to do? Looking forward to Hydra today. We have to leave early to get a decent berth apparently so we don’t have to walk across other boats. Don’t feel sorry for me: ‘early’ is 08:30! And I’m in a cafe over the road having coffee now, at 07:36, and there’s not much life on our boat yet with breakfast still to be served and eaten. One person is sleeping in the salon, at the meal table. She hates her cabin, a 2 berth. Despite being the sole occupant she opted to move out and refers to it as the sarcophagus. Two have bunks in the other aft cabin, the captain is in the proper aft cabin, under the anchor locker. The remaining 2 of us each have a single in the stern of the boat. Us with singles are each next to a shared head. I like my room. Not spacious but well and truly enough for one. Turn little lever to the left, action, pump 10-15 times to clear ‘the act’ away, turn lever other way and pump about 5 times. Despite living next to a head, it’s very quiet during the night. Now, my fellow travellers are continuing to prove interesting. L has a few difficult corners. I avoid them so I can enjoy her intelligence etc. C has remained fun, lighthearted, easy to be around. D insists on chattering and always giving all the details. When I bought this from the x store…. ; stating the bleeding obvious as to why something is being done a particular way; and incessantly relating what her adult kids do and like; ahhhh. Like an OTT primary school teacher but one who is unable to adapt when her pupils show signs of understanding something. S is hard to describe. So far beyond my experience I have trouble. Put it this way, we motored for hours to Hydra, competed with many other yachts for a berth, docked and are now off it and she stayed zonked out through all this. She was up a few times overnight and obviously can’t sleep without chemical assistance. And the Captain: very impressive. Knows what she wants and gets it. More when I get over the horrors of getting a berth in Hydra! Unbelievable…. I missed another couple of spats apparently. One was to do with S smoking in her cabin and the other, I don’t know. Don’t really want to know either. Happier to be out of it but did spend time last night with S to keep her away from L.
Must go. Cook/first mate has just come into cafe I’m in. Guess it means no action yet on boat, especially with L sleeping at the table! The yacht leaving before us had its anchor caught up in ours. Drama, as the other skipper was not especially proficient and, had problems with his winch as well. 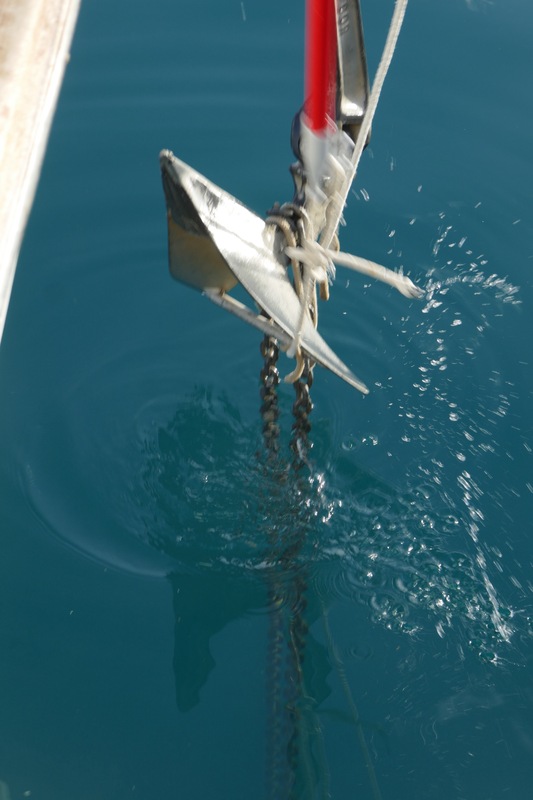 The anchor had to be pulled up and the other chain lassoed and pulled off. Not unusual apparently. We arrived at about 10:00. Well, so did 6 other boats, just behind us. 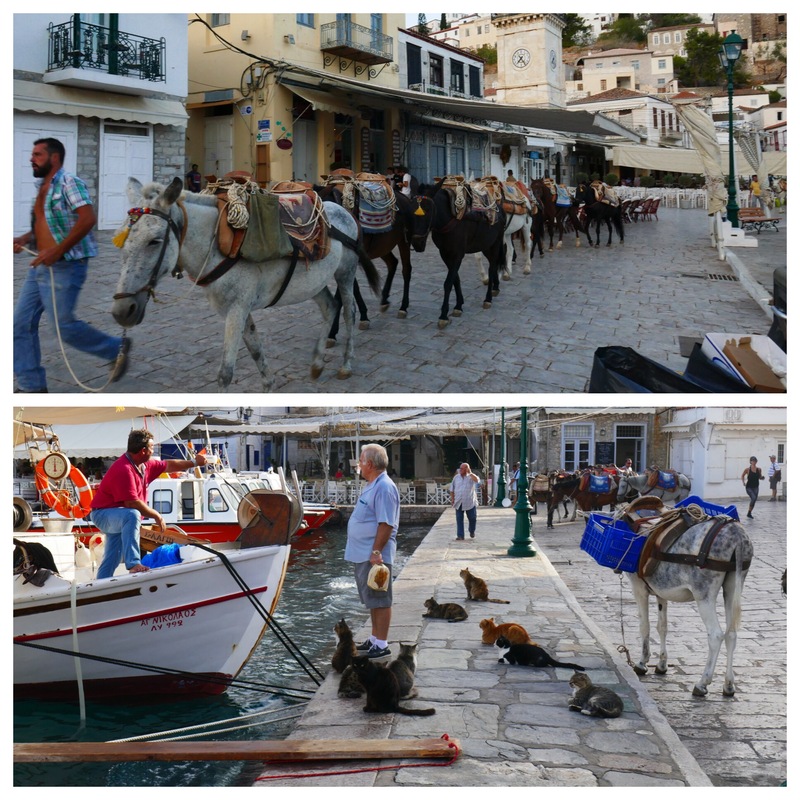 And the morning exodus from Hydra hadn’t yet started. Well, the manoeuvring forwards and backwards so no one ran into anyone else and we preserved an order of arrival for berth selection was a little stressful! The narrow harbour entrance with so many boats manoeuvring compounded the stress levels. Our captain is impressive. And we got a good berth as a consequence. Hydra has no shore power for anyone but our location was great. I need to walk. Got wifi, had a coffee and I’m off walking. Once I download a map. As usual, the monastery is on top of a hill, about an hour above the town. What is more impressive than most is its location right up on top of the overlooking hill. Good view from up there down over the town. Hydra is my favourite place by far. Clearly many rich visitors, see the prices in the shops. Lots of donkeys, cats and big and small boats. Truly beautifully maintained place. Very obviously wealthy. No vehicles, except a dead tractor, one cart and the garbage truck. We have an undeclared war operating. Madam ‘now rich’ is drinking all hours of the day and night and smoking on the boat. These 2 activities guarantee she will upset most others. Plus, she keeps odd hours, very odd. Last night she was perched on the edge of the deck loudly chatting up a guy from another boat until at least 02:00. Then she apparently clanked her way around in the fridge getting ice for her next drinks. Unusually, she is up now, 07:00 ish. A bottle is still on the deck and a glass with a red ring under it. The other 3 are endlessly fascinated, and reasonably, annoyed by her. I sleep very well so don’t hear much of the nocturnal activity. Heard ‘her’ visiting guy serenading her very proficiently, with a guitar, and I went off to sleep again. Thankfully I can keep separate from all others. Some are horse riding this morning so I’ll go walking, alone, again. Very happily. But, this is not a well functioning group! In truth, the preaching supply teacher bugs me more with her excessive details on EVERYTHING. But, she is very personable and nice so I try to just tune out. I’m getting better at that. And I go off alone. Phew…..
And madam ‘now rich’ seems to feel I’m an ally as I listen to her repeat the same stories every opportunity she can. I limit them but get caught at times! Wifi is godawful so only very very small photos are uploadable!